African American men with curly hair usually have to treat their hair with special care. Their hair has a tendency to be dry and prone to breakage. 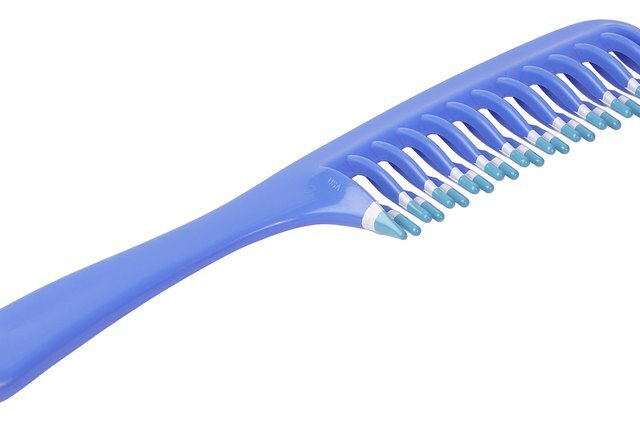 A comb is often difficult to use on curly hair and may tug at the hair, causing discomfort while breaking the strands. A conditioner and de-tangling spray helps to ease the strands of hair apart for smoother combing. The correct products paired with appropriate tools will ensure proper care of African-American men's curly hair. Shampoo the hair with a conditioning shampoo and then thoroughly rinse out the shampoo. Massage a conditioner into the hair and scalp and leave it in for five minutes. Rinse the hair well and then wrap a towel around the hair. Squeeze the water out of the hair with the towel. Avoid rubbing the hair dry, because the friction can cause knots and tangles. Spray a de-tangling spray on the hair. Spray it all over the head but avoid saturation. Grab a handful of hair and start combing the hair with a wide-tooth comb about one inch from the ends. After the knots are removed from the end section, move closer to the scalp. Continue in this manner until the hair is tangle free from the scalp to the ends in that section. Move to another section of hair, and repeat Step 4. Continue around the head in this manner until the hair is free of knots and tangles. Use a pick to fluff up the hair. 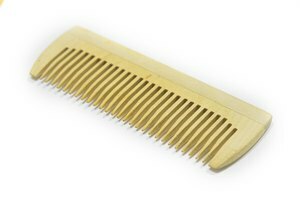 Comb the hair with the pick from the scalp to the ends. Then, take your hand and pat it down slightly, coaxing some bend into the curls and pushing the hair closer to the head. Start with Step 3 between shampoos. Wear a scarf or "do-rag" while sleeping.